Some of my portrait paintings displayed against Burning House Art Studio interior. First of all, I am thrilled that it happened! My first ever portrait painting workshop, after a long time talking about it and planning and figuring out! I had a blast, and it went even better than I expected. My students were amazing! I thought it was very important, though, to give my students the opportunity to study a three-dimensional model of a face before turning to their own photo references. I also encouraged them to draw from life, from real people as much as possible. It is my opinion that you can learn to copy photographs fairly quickly, and it is a shortcut to producing paintings. However, it is a shortcut at the expense of your understanding of the structure of human head. As a matter of fact, I think that not only about portraits but any other subject...If you are after a convincing traditional representation of anything, you should spend time observing it, and drawing and painting from life is the best kind of observation. Unfortunately, there was not enough time in the two days to work from a live model. I am considering either expanding the workshop into another day or two or creating an advanced level workshop. On day 2, we painted from photos, which we analyzed and discussed at the end of day 1 (each student brought their own photo references) and which we used to create grid method drawings at home. I was curious to see if it would be possible for a student to leave my workshop with a finished painting. And it is! I was very proud with the results and I think having a painting of their own at the end of the workshop gives everyone a sense of accomplishment. Quite a lot of the workshop consisted of one-on-one coaching - which, I think, is where most of the value of the workshop was - I would love to have a mentor myself. It helped to have a small number of participants. A large group would make the individual attention pretty much impossible. My next workshop is scheduled for September 21-22. Read more about it and register here. My Portrait Painting Workshop is this weekend! I can't believe it, but yes! 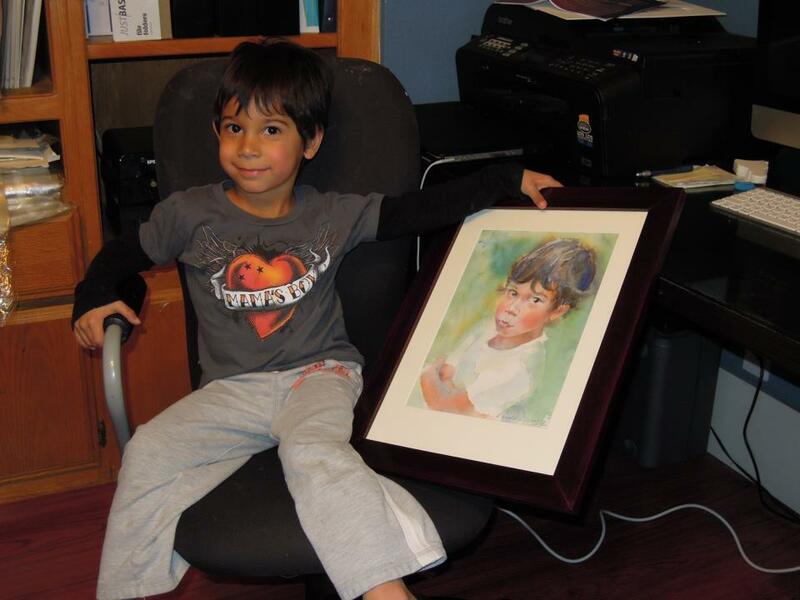 This weekend, August 3 and 4, I am teaching my first Portrait Painting Workshop! My past students probably remember me talking about wanting to do a workshop like this forever, and now it's happening! :) Thank you to Joan Sowinski for hosting it in her Burning House Art Studio and to those who already signed up. A couple of people had to cancel this time, so I have a few spots still available. I have lots of material...more than I can squeeze into two days, but I will try my best to give as much as I can. I am hoping we will even have some time to work with a live model! Some time last year, I was approached by this little girl's dad who asked me if I would be interested in participating in their project. The essence of the project is this: artists and illustrators are invited to create artwork based on or referencing photos of Adora, a 3.5 year old girl. At the time, I was not interested (partly, due to the fact that I would be doing this essentially for free). But it has been in the back of my mind since then, and when I was asked to do a painting demo for a local art club, I found a photo of Adora that inspired me and used it in the demo. I really liked the quality of light in the photo and how intense the little girl's expression was. It was fun to paint it. I skipped the drawing and jumped right into it, painting directly. I was working from a black and white printout of the photo and pretty much made the colors up, referencing also my impression of the original photo. I was talking the whole time and answering questions, which was remarkably easy for me. It is pretty interesting how such an introverted and private person as myself can be so comfortable doing public speaking. It could be just the art-related public speaking, I guess. Something I am passionate about and happy to share :) I am doing another demo for a larger group on May 29th. Hope it goes well! Here is another one of my Christmas commissions, two beautiful little girls who are cousins and live on the opposite sides of the U.S. I painted this in record time - less than a week. As it often happens with my group portraits, it is a composite of several reference images. I enjoyed working in a looser, more "impressionistic" manner, which is also part of the reason why I could finish the portrait in such a short time. The multiple-glaze smooth and "realistic" look requires that the bottom layer is bone dry before applying the next one. If you are interested in a custom portrait, go here. My new website design is up and running (thanks to my wonderful husband :)) but will probably be a work in progress for some time. I still need to find a good way for people to shop my greeting/note cards and some logical place to put my artwork that is not for sale (like the sketchbook section). Any ideas? What do you think about my website in general? Wedding portraits? Yes, I can say now I've done that, too :). And with the Valentine's day impending and all, I thought I'd share a recent wedding portrait I did for a wonderful new collector. This is one of my smallest portraits ever (rivaled only by the Icelandic Lady) and it gave me the opportunity to work with some brushes I normally never use - like #3 and 4 red sables. It also involved quite a bit of imagination, since this couple did not have high quality wedding photos, and development of a few ideas before we settled on this version. Interested in having your own wedding or anniversary portrait? Here is how it works. I enjoyed working on this painting, even though it took me forever. I'm pretty pleased with myself for not overdoing and overdetailing it too much. I think I managed to keep the original exciting colors and amplify them a bit. Elza, the dog's owner, will be getting this original painting for free :) Read about how you can order your own custom portrait here. Otherwise, I am feeling swamped...(insert a long rant about not having time to paint anything other than commissions, not having time to answer emails and comments, and in general not having time; being exhausted by my own kid and occasional marriage drama; not having a single soul to go have a cup of tea with; and an overall state of blues). Yeah. On a good note, I started giving private art lessons and it's been interesting so far. Tomorrow is our fourth lesson. I'm happy to share with you one of my latest custom works - the portrait of Andrea. The way that this painting came to existence is pretty sweet and romantic. Inspired by my painting of Brooke, Andrea's husband walked straight into my booth at the art & wine festival and told me about his idea for a painting of his wife for her birthday. That was during the Lake Arrowhead Rotary Art&Wine Festival at the end of June and her birthday was on July 12. So, a few days later I was already working on this painting. I fell in love with the reference photo. The light was perfect, the pose natural and beautiful. Since it is a generous 20x16" size, I could work in life size and not worry too much about insignificant details. I finished it in about a week, which is probably my record for commissions. Not having my son at the time (he was with grandparents in Sacramento) definitely helped with that. I was fairly pleased with the range and quality of art and high end craft that was represented at the festival and with the quality of the visitors. For such a tiny mountain community, the event drew quite a crowd. It actually looks more colorful and the values are a bit darker in real life...Of course, I wished I had more time to work on it, especially since the model was doing such a good job sitting there. On the 4th of July, we went to Ventura for the 4th of July Street Fair - which turned out to be a total waste of time and money. I'm not sure what happened, but it shouldn't have been advertised to artists as anything having to do with fine art. There was a lot of nice clothes and trinkets, which, I'm sure, sold quite well. There was good music and tasty food. However, it just wasn't made for fine art. So...I feel at best misinformed and overall very disappointed. On a good note, my video interpretation of the Vase with Twelve Sunflowers has been featured on Watercolorpainting.com, which is a very informative website on, yes, watercolor painting. If you haven't been there before, go check it out! 12x9" watercolor on Canson Montval paper (which, it turns out, not only allows you to wash away paint very easily but can, with equal ease, get the paint smeared off during normal handling :/). This one is based on one of the 600 or so photos I took at the Renaissance Pleasure Faire last weekend. The girl was auditioning for Shakespeare. Not sure what exactly she was reading - first of all, I couldn't hear her very well, and second, I read most of my Shakespeare in Russian. We've been trying to be a bit more active last month. Went zip lining in Big Bear at the beginning of May (that was also our wedding anniversary) and also to the Renaissance Faire last weekend. Both were quite fun, although I think I liked zip lining better... It was a rare kid-free outing and there were only two more people minus the guides with us. I'm all for less people = more fun! Here's yours truly dressed up for the Faire and wearing one of the wonderful masks that were for sale there. I intensely wished I had more money to spend. More pictures from the Ren Faire in my Facebook album. A Portrait A Day 59 - K.C. 12x9" watercolor on Canson Montval 140lb watercolor paper. Painted from life during an art show. About 20-25 minutes.